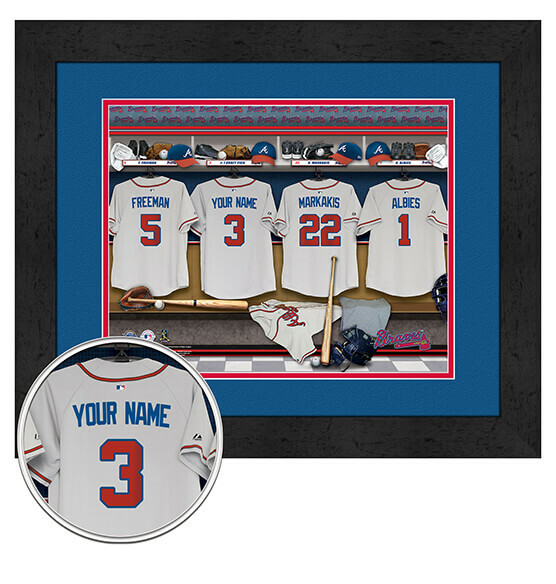 For an MLB baseball and/or an Atlanta Brave franchise lover, there may be no better gift than this charming Customized Locker Room Framed Artwork. Add a name (up to 12 characters) to the back of one of these locker room jerseys for a personalized Atlanta Braves baseball gift that will go down in history as the best. Gift. Ever! Complete with a digital double mat in team colors, MDF vinyl-wrapped black frame and a high-quality, vibrant print behind glass, this piece comes ready to hang with a convenient sawtooth hanger. Ideal for holidays, birthdays, anniversaries — or just because.